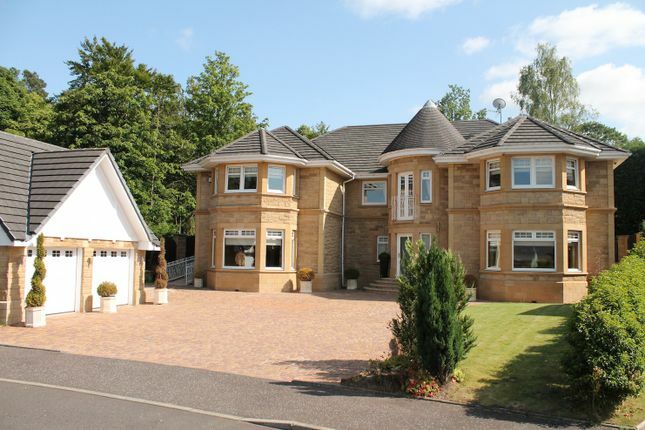 Countess Gate is arguably one of South Lanarkshire’s most exclusive and sought after addresses and number one is a fabulous example of innovative architecture coupled with a unique secluded location. Set within a generously fronted plot, this stunning family home with finishings of the finest quality offers generously proportioned apartments centred round a grand entrance hallway with feature sweeping staircase and limestone tiled floor. As one would expect with a home of this calibre all finishings are to the highest standard and include light oak skirtings, facings and doors, limestone and ceramic floor tiling, sumptuous carpeting and tastefully interior designed apartments throughout. Further benefits include a fully integrated Sonos sound system, monitored security alarm and underfloor heating. The floor plan overleaf shall provide a detailed layout of this most impressive home however we highly recommend internal viewing to appreciate the scale and quality of accommodation on offer. The versatile accommodation provides fabulous space for both entertaining and family living and comprises on the ground floor of grand entrance hall with feature staircase and open plan reading area, outstanding traditional style kitchen by Clive Christian which is dominated by an oak centre island and has an abundance of cupboards with solid granite work surfaces and a combination of Neff and Siemens appliances, open plan dining area off, comfortable garden room, television room, formal principal lounge, formal dining room and cloaks wc. The upper landing again continues with the same theme as the lower level with the main hallway being open plan and incorporating a comfortable sitting area against a backdrop of the impressive swept staircase. Leading from the hall are four beautifully decorated double bedrooms with all having en suite facilities and both the master and second bedrooms having dressing areas also. Bedroom five has been converted to provide a fully operational home gymnasium with mirrored surrounds, hardwood flooring and an open plan jacuzzi area located off which also includes a shower/steam cabinet.. The third floor can be accessed via a spiral staircase and provides great entertaining space which is currently being utilised as a games room with bar. The front gardens are open plan and dominated by a mono block driveway which provides ample parking for several vehicles whilst surrounding the driveway are lawned areas with a border of specimen plants. The front garden also has a double detached garage providing secure parking for two vehicles. The fully enclosed rear garden is bounded by timber fencing and has an elevated sun deck with private aspects. The village of Bothwell is highly regarded for its excellent main street where you can find the majority of every day shopping needs. There is a great choice of restaurants, bistros, pubs and many more found within nearby Hamilton town centre. The property is located within popular school catchments and also within short proximity to Hamilton College. For those commuting by public transport there are regular bus and train services from Hamilton and Uddingston to the surrounding towns and cities including Glasgow and Edinburgh. The M74 motorway provides excellent access to the central belt linking the surrounding towns and cities. Sports facilities are in abundance and include golf courses, swimming pools, gyms and country parks with picturesque walks.